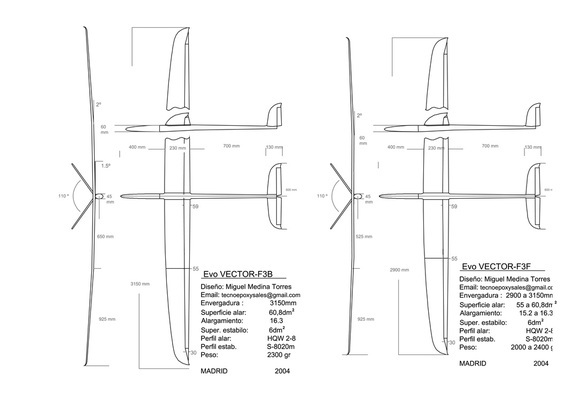 The vector is a model specifically designed for F3B and F3F competition. It's modular design allows to build it with a wingspan between 3150 and 2900 mm. Also we could build the wings in two techniques. Hollow with carbon and herex sandwich skins and also solid foam core with carbon skins. We have available an electric fuselage, which in addition of an extra light laminate similar to that employed in the Latigo F3K, It consist in a Dbox of Textreme and Disser over Rohacell sandwich, which allows us to create F5J version. or with the standard fuselage an F3J version. The weight including propulsion equipment in F5J version is only 2000 gr, allowing you to have a very competitive model in this category. Its smooth finish allows it to move at high speed between thermal and thanks to the use of his flaps can reduce airspeed when turning thermals.